Portugal's police said Wednesday they had arrested 61 suspected arsonists so far this year, with fires on the rise and figures showing the largest number of people killed in forest blazes since 2003. This year's fires, as well as killing more than 60 people and injuring hundreds more, have destroyed 141,000 hectares, civil protection officials said, citing provisional figures. That comes to three times more than the average over the past decade. 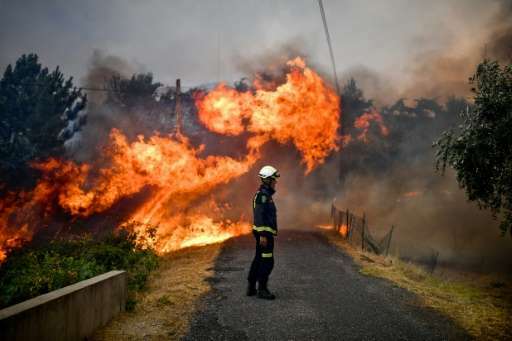 The exceptional heat and dry conditions, coupled with strong winds, helped explain the scale of the destruction this year, said Rui Esteves, commander of the ANPC, Portugal's civil protection agency. Firefighters have had to tackle a little over 10,000 separate fires so far this year—2,500 more than at the same period the previous year. Although the destruction wrought so far this year does not match the record 426,000 hectares destroyed in 2003, this year's fires have been the deadliest. Wildfires that broke out in mid-June claimed the lives of 64 people and wounded more than 250 others near Pedrogao Grande, in the centre of the country. Some of those who died were caught in their cars as they tried to flee the flames. Another wave of fires this month has injured 74 people so far, six of them seriously, forcing Portugal's emergency services to call on international reinforcements. Nearly 700 firefighters, 200 fire engines and a dozen firefighting aircraft are still fighting two major fires burning in the central regions of Santarem and Castelo Branco.